Meatballs are a weekly must in our home. They’re simple to make and very versatile. Plus, meatballs make a great snack served solo or the protein component of your salad for lunch. Bison meat is one of the richest natural sources of CoQ10 (an antioxidant helpful in improving heart and neurological health). Variety is critical for your pup to receive the full spectrum of amino acids, essential fatty acids, and trace minerals, vitamins, and antioxidants necessary to thrive. This is a great alternative to include in both you and your dog’s diet. 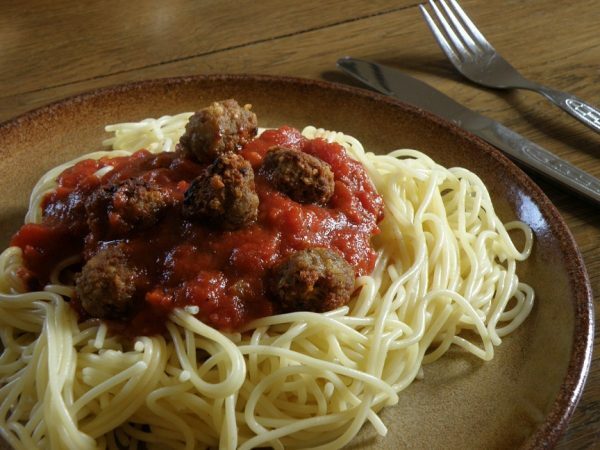 Combine all the ingredients except the olive oil spray and marinara sauce in a large mixing bowl and shape into about 30 meatballs 1 inch across. Coat a large nonstick skillet generously with olive oil. Cook the meatballs for 6 minutes, working in batches if your pan is not large enough to fit them all, occasionally moving them around to brown all sides. Once all the meatballs are cooked, separate out a portion for your pup with no sauce. Add a jar of low-sodium marinara sauce to the pan. Simmer the meatballs in the sauce for 20 minutes. Serve over zucchini noodles or whole-grain pasta. Serving Size: 6 meatballs for Mommas and large pups; 3 for small pups.